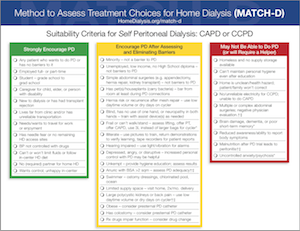 The non-profit Medical Education Institute, Inc., developed the Method to Assess Treatment Choices for Home Dialysis (MATCH-D) for Home Dialysis Central to help nephrologists and dialysis staff identify and assess candidates for home dialysis therapies (PD and HHD). It is designed to sensitize clinicians to key issues about who can use home dialysis. If you would like a version of MATCH-D created specifically for your country, please contact us! This recorded session, entitled A New Home Dialysis Appropriateness Tool: Method to Assess Treatment Choices for Home Dialysis from the ANNA National Symposium, 2008, examines the benefits of home hemodialysis for patients, providers, and payers. In order to make this modality available to patients who may benefit from it, Dori Schatell, Executive Director of Medical Education Institute, Inc., provides examples of the challenges faced in identifying the appropriate dialysis modality for each patient. Get it here. Calculate is a next-generation clinical calculator and decision support tool for iPhone, iPad, Android and BlackBerry, freely available to the medical community. It was developed by QxMD Software. Download the app here!